The UK beats other European countries hands down when it comes to top universities, according to the latest rankings compiled by Times Higher Education (THE). Already famous for two of the world’s best universities – the University of Oxford and the University of Cambridge – the UK is also home to 40% of the top 20 European universities. This chart shows the countries in which Europe’s Top 20 Universities are located. It shows that the UK outperforms its nearest rival, Germany, with twice the number of top universities. Eight UK universities make up 40% of the European top 20. The University of Oxford tops the European rankings (as well as the world rankings). It’s the oldest university in the English-speaking world. Germany has 20% of Europe’s best universities. Its leading institution is LMU Munich , which sits in 9th place in the European top 20. LMU Munich counts 26 Nobel Laureates among its staff and alumni. The Netherlands takes third place, with 15% of the top European universities. Its highest ranked institution is the Delft University of Technology . Switzerland has 10% of the best performing European universities, including ETH Zurich , which is ranked in fourth place in the overall European top 20. 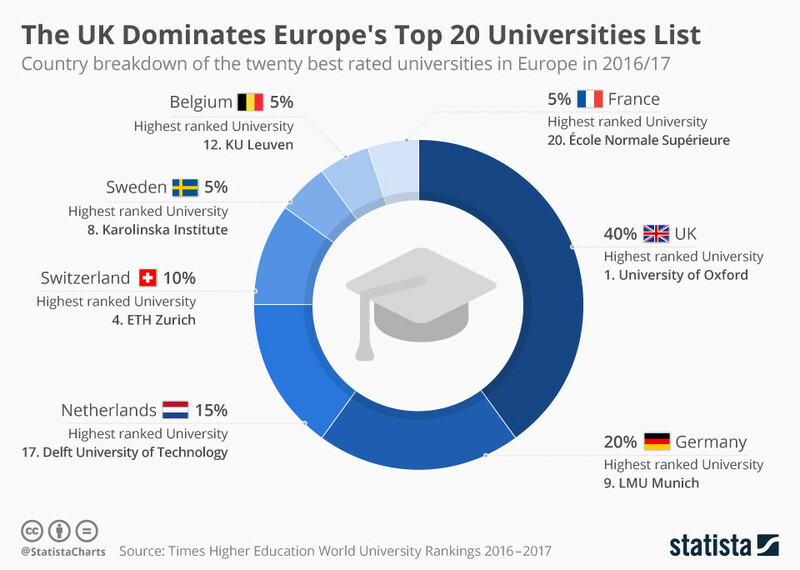 Sweden, Belgium and France can all claim 5% of Europe’s top universities with Sweden’s Karonlinska Institute (8th), Belgium’s KU Leuven (12th) and France’s École Normale Supérieure (20th) among the top performers. Europe performs strongly in the THE world rankings as well. Out of 980 universities almost half, just under 400, are in Europe. Asian universities are climbing in the rankings. Overall, 289 Asian universities from 24 countries make the list of 980. Nineteen are in the top 200, up from 15 last year. THE also reports that a new breed of younger universities may soon be challenging the established elite. It says a group of 53 newer universities have a good chance of competing with older institutions. The group is global and includes universities from 11 countries across North America, Europe and the Asia-Pacific region. Imperial College London, the University of Toronto and the National University of Singapore all make the grade. While rankings can be useful, they aren’t a definitive measure, says the World Bank’s Lead Tertiary Education Specialist, Francisco Marmolejo . They can also have negative consequences, he says, especially when rankings become the main driver for decisions made by governments and educational institutions. In addition, he says, they only represent a one-sided vision of an institution, ignoring the fact that a university needs to respond to the communities in which it is based. Times Higher Education says its rankings are the most comprehensive global measure of universities. The rankings draw on 13 separate performance indicators, assessing institutions on their core missions. These include research, teaching standards, knowledge transfer and international outlook.